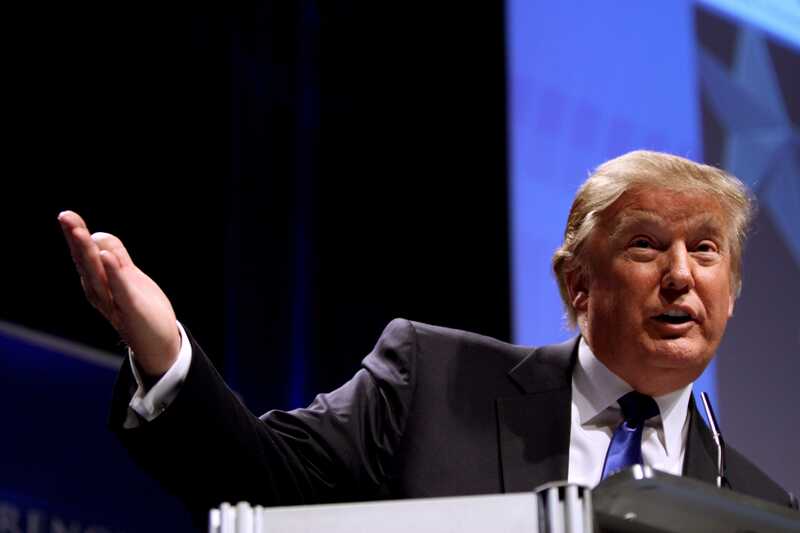 The US government has postponed the introduction of punitive tariffs on European products such as steel and aluminium for the time being. But instead, they are now considering restricting the volume of exports from Europe through an import quota. In general, such import quotas have the same effects as tariffs on imports, leading to higher prices for US consumers and losses for European exporters. Why are import tariffs imposed? The starting point of the following considerations is an economy for which the world market price of the product on which a tariff is to be levied is a given quantity. The domestic market – the USA in our example – thus has no influence on the world market price. Graphically this means that the supply curve of the rest of the world (SupplyWorld) is flat and runs parallel to the quantity axis in the price-quantity diagram below. By contrast, the supply curve of American companies (SupplyUSA) is has a positive slope: a larger quantity can only be offered at higher costs – and thus also at rising prices. The demand curve of US consumers is shaped by the assumption that the quantity in demand decreases when the price of the product rises. The demand line (DemandUSA) therefore has a negative slope. 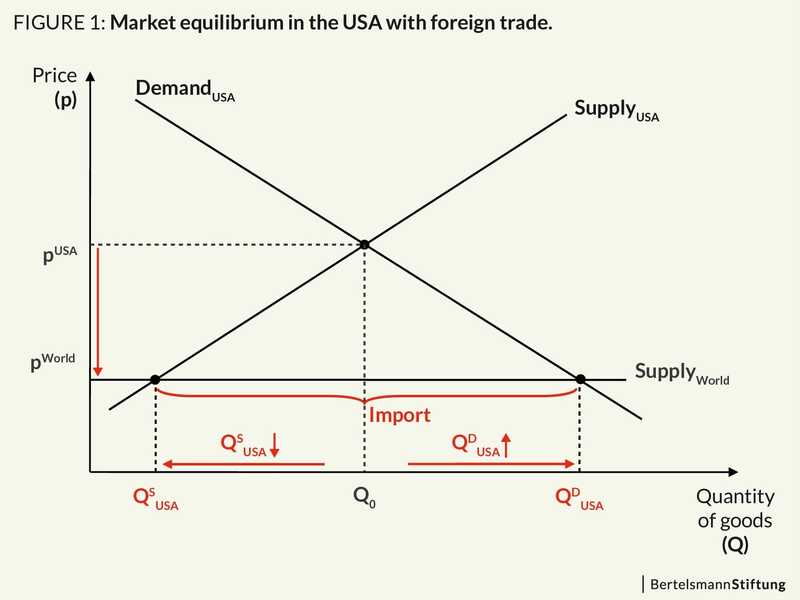 The resulting market equilibrium depends on whether the world market price is higher or lower than the price of goods in the USA without foreign trade relations. Since trade restrictive measures only make sense if US companies have to be protected from competition from abroad, it is fair to assume a world market price (pWorld) below the domestic price (pUSA). This situation is shown in Fig. 1. If the US opens its borders to foreign products, the price that US consumers have to pay will fall to the world market price level. This is a positive development for consumers: they can buy a larger quantity of goods at a lower price. US companies, on the other hand, are reducing their production. The difference between the increased demand (QDUSA) and the decreased supply of goods (QSUSA) is covered by products imported from abroad. How does an import tariff work? The decline in the domestic supply of goods may encourage the US government to impose a tariff on imported products. 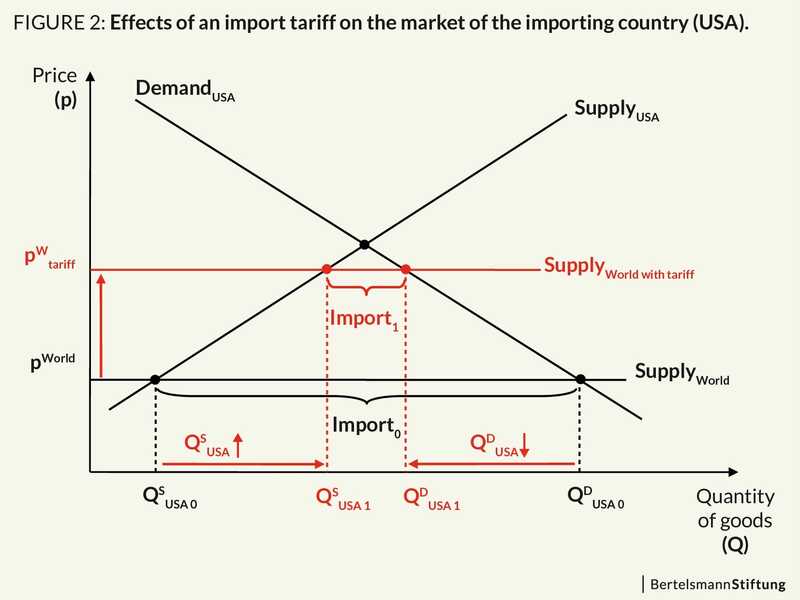 Graphically, this means that the foreign supply curve is shifted upwards in parallel – the price of imported goods equals world market price plus the tariff. Due to the higher price, the volume of goods demanded by domestic consumers is falling. The supply of local companies, on the other hand, is growing. The consequence of these two developments is a decline in imports (from Import0to Import1, see Fig. 2). The goal of import tariffs – an increase in domestic production and thus also likely in employment – will indeed be achieved. However, the protection of the domestic sector is paid for by US consumers. They can now only consume a smaller quantity of goods for which they have to pay a higher price. How does an import quota work? At the world market price (pWorld), American companies offer the quantity of goods QSUSA 0. Together with the imports, the quantity QSUSA 1is offered on the US market. At the world market price (pWorld), however, a much larger quantity is demanded by American consumers (QDUSA 0>QSUSA 1). This excess demand leads to an increase in prices. At the higher price, other US suppliers are now ready to offer their products on the US market. The quantity of goods offered by US companies is increasing. This process continues until the excess demand is reduced and point A is reached. The new market price (pWquotain Fig. 3) is the same as the price in the case of an import tariff (pWtariffin Fig. 2). The quantity of goods purchased by US consumers also corresponds to the quantity in the case of an import tariff. 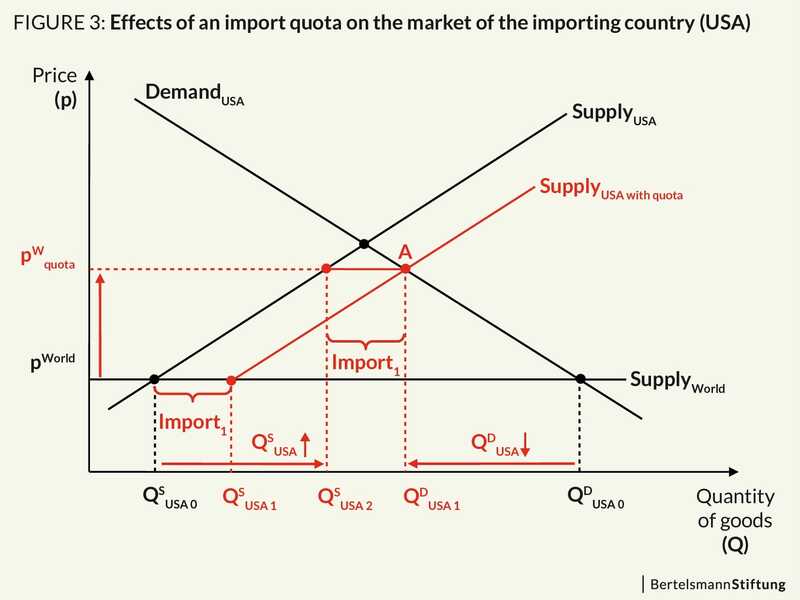 Under the assumptions made here, an import quota has the same price and quantity effects as an import tariff. The negative effects on the purchasing power of US consumers, on productivity growth, on the international competitiveness of US companies and on the American GDP are also consistent with the effects of an import tariff. A quantitative restriction of US imports thus harms the entire US economy just as much as a tariff levied on imports.